In my previous post I talked about kung fu at sea. 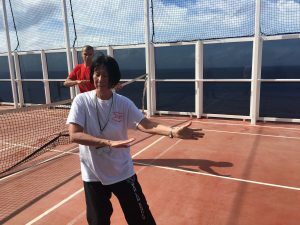 Tai Chi at sea is equally as challenging as kung fu, as I need extra balance on a moving ship. Most days are smooth sailing, but there are some windy and rocky sea days that make tai chi really difficult. I admit, when I am at home I rarely practice tai chi. If I do not get my kung fu training in as often as I would like, you can only imagine how frequently I fit in tai chi training. I find tai chi and meditation really challenging because it requires one to move slowly. I try to meditate in the morning to start my day, but my mind is usually racing to ‘get to work’. I’ve been working on reminding myself that in order to ‘get to work’, meditation helps me to reset and gets my brain ready to function properly. Our daily routine has been doing kung fu in the morning and tai chi in the afternoon. This might seem odd to those who know tai chi is usually done in the morning, but we meet the needs of our instructors’ schedule. As many of you who frequent the Temple early mornings know, my father is a morning person, so that is when we do kung fu. Since I have been practicing chen tai chi (the older form of tai chi and the one most like kung fu), it feels good to practice in the afternoon, as I need to be warmed up to tackle it. For me, the biggest challenge with tai chi is the fluidity and pacing. I am so accustomed to kung fu, that learning to slow down and pace myself is not easy for me. However, I know that this is the yin and yang to life, and practicing both kung fu and tai chi will help keep me balanced in the long run.